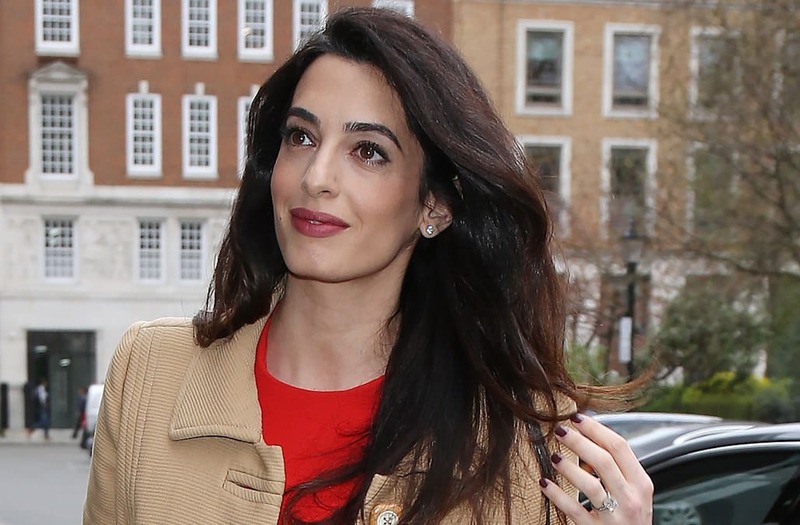 Amal Clooney stepped out in London on Tuesday and gave us all serious #PregnancyGoals. The 39-year-old human rights lawyer looked radiant in a vintage Dior dress, camel Balmain coat and cute floral slingback pumps by Oscar de la Renta. She wore her raven tresses in a relaxed hairstyle while keeping her makeup to a minimum. Paparazzi captured a few glimpses of her growing baby bump, but the loose-fitting style of the frock made it easier to hide it. Amal, who's expecting twins in June with her hubby George, was on her way to deliver a speech on war crimes in Syria and Iraq. After the event, the mother-to-be was spotted getting dinner with her own mother, Baria Alamuddin. Baria looked just as chic as her gorgeous daughter in a eye-catching blue pantsuit combo. Now we know where Amal gets her impeccable fashion sense from! And while the attorney is busy taking care of business in London, her husband is all the way in Las Vegas for CinemaCon. The "Money Monster" star got candid about his wife's pregnancy while promoting the trailer for his latest directorial project, "Suburbicon." "My wife says I can't name them Casa and Amigos. That's the one thing I'm not allowed to do," he hilariously revealed. "It was just a thought. I mean, you know, it's a family business."